Earn 1 Mile for every Php 100.00 (or converted equivalent in foreign currency) spent on Qualified Purchases. This prepaid card will allow you to purchase products and services in the local currency in stores that accept UnionPay. Received your Mabuhay Miles Travel Card already? Click here for more information and how to use your Travel Card. Register at the Travel Card website to manage your Travel Card. Load into other currency wallets (subject to PAL conversion rates). Load into other currency wallets (subject to conversion rates). Accepts PHP bank notes and will load directly into your PHP wallet. Availability of this feature is dependent on your bank. Your bank's transaction fees may apply. Why should I use the Mabuhay Miles Travel Card over the other cards? Your Mabuhay Miles Travel Card earns 1 Mile for every Php100 (or its equivalent in foreign currency) spent. It is the only Travel Card that contains a PHP wallet so you can use it both in domestic and international transactions. It is a multi-currency card that will allow you to spend in the supported local currency without worry of fluctuating exchange rates. By being able to spend using the local currency, it will also allow you to manage your funds better while you travel. Skip the call to your bank when converting your point to Miles. Your Miles will be credited directly to your Mabuhay Miles account, not to your Travel Card account. 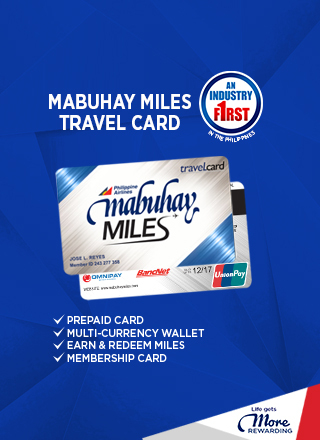 What is the difference between the existing Mabuhay MIles Membership Card and this new Mabuhay Miles Travel Card? For Elite, Premiere Elite and Million Miler members, your Mabuhay Miles Membership Card will 1) remain solely as a membership card and 2) will indicate your tier status and benefits. The Travel Card will function as your multi-currency prepaid card. For Classic members, the Travel Card will serve as both the membership card and the multi-currency prepaid card. Where can I use my Mabuhay Miles Travel Card? You can use the currencies in your Travel Card in stores worldwide that accept UnionPay. You can also use your Travel Card to withdraw cash and check your currency balance at BancNet ATMs in the Phillippines and international ATMs that accept UnionPay. Who are eligible for the Mabuhay Miles Travel Card? The Travel Card will be issued to active Mabuhay Miles Members with Philippine mailing addresses. Members must be at least 13 years old and above, and have a valid activity noted in their Mabuhay Miles account in the past two years. Cards will be sent to the preferred addresses indicated on their Mabuhay Miles profiles via courier at the soonest possible time. How do I check if my Mabuhay Miles Travel Card is on the way? You may visit www.airspeed.com.ph and input your 9-digit Mabuhay Miles Membership ID to check if your Travel Card is on the way. How do I request for a Mabuhay Miles Travel Card? Your Mabuhay Miles Travel Card will be sent to you at the soonest possible time after a valid activity is noted in your Mabuhay Miles account. If you have a valid activity after November 24, 2015 but haven't received your card, you may send an inquiry via email to travelcard@mabuhaymiles.com or call our hotline. UnionPay's footprint has expanded and is widely accepted in 157 countries and regions, at more than 34 million merchants and over 2 million ATMs worldwide. In ASEAN, UnionPay has enabled ATM, POS acceptance and card issuance across all 10 countries. In the Philippines, UnionPay works with OmniPay, PNB, BDO, Bank of China, and RCBC.